ARP Omni symphonic electronic keyboard advertisement from page 28 and 29 in Contemporary Keyboard January 1977. 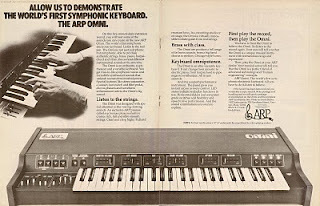 This was the first ARP Omni ad to appear in Contemporary Keyboard. A two-pager that only ran once as the centerfold in the January '77 issue. And I would have to say it is on par with other centerfolds I may have come across as a kid in 1977. Wink wink. The ad sports a fantastically large photo spread across the full two page width. It also includes great ad-copy with good action items positioned as sub-titles. Lines like "Listen to the strings" and "First play the record, then play the Omni" are always pushing the reader towards the end goal - buying an Omni. And that OMNI logo on the top of the instrument is to die for. Seriously. When I became interested in the Omni and started doing some research, the keyboard was looking like some kind of ghost at first. You only have to look at the first sentence of the ad-copy to see why. "On this five-minute demonstration record, you will hear some of the sounds you can create on the new ARP Omni". Most Web sites list the production start date of the Omni as 1975 (Vintage Synth Explorer, Wikipedia). Even the book "Vintage Synthesizers" by Mail Vail indicates that, "the company's all-time best-seller was the Omni, introduced in 1975." Was it just new to Contemporary Keyboard readers then? Even more odd, just the previous year ARP ads were showing up monthly in CK magazine, including two "family of products" ads running in 1976 that featured a wide range of their products. For example, this ad from May/June 1976, and this one from March/April 1976. And NEITHER of those family ads included the Omni either. Wussup? If ARP was cranking out this keyboard out as early as 1975, why wouldn't they include the Omni in any of those "family of products" ads? ARP's String Ensemble is in both of these advertisements, so it's not like those two ads were "synthesizer-only". And, I would think that the Omni would have had it's own series of ads much earlier than January 1977 if it was ARP's "all-time best-seller". There is definitely some evidence that the Omni was available prior to this two-page introductory ad, but not anything near 1975. A month before the advertisement came out, the Omni promo appeared in the Spec Sheet section of the November/December 1976 issue of Contemporary Keyboard. CK had only been publishing every second month for the last year or so, and at this early point in CK's life, it wasn't uncommon to promote synthesizers that had already been available to the public for quite some time. But even so, I would have expected to see this keyboard promoted much earlier considering it's popularity. "ARP SYNTHESIZER: Capable of producing realistic string, brass, piano, harpsichord, and vibes effects, the Omni synthesizer features stereo outputs, waveform enhancement, built-in chorus phasers, and split keyboard. A VCF and an ADSR envelope generator are supplied, and the instrument's effects can be mixed together. For example, the musician can play the machine's violins and horns, and then add a separate string bass line on the left end of the keyboard. Its control panel includes computer-grade switches and LED status indicators. The unit weighs 33 lbs. Cannon XLR connectors are provided and interconnection to other ARP synthesizers is possible via systems interface jacks. List price is $2,250. ARP instrument, 320 Needham St., Newton, MA 02164." A similarly small "Equipment Review" appeared in the November/December 1976 issue of Synapse magazine. And to me it suggests that the Omni is quite new, ready to drop-kick the aging String Ensemble off the map. "The Omni employs the most modest approach to polyphonics and also has a modest price: $2395. It is essentially two instruments played from one keyboard. The one half of the Omni is a string synthesizer possessing truly remarkable, lush sound. Undoubtedly, the Omni will soon replace ARP's own more ready-sounding String Ensemble. The other half is the synthesizer itself, the part subject to timbre variation. As in the polymoog, all frequencies are generated by top-octave division, so the sound is a little thin. Another weak point is the single trigger for all keys; notes can not be individually gated or filter swept. But what do you want for $2395? There are some distinct touches, such as a foot pedal that controls envelope decay time, and a slider pot that mixes together the string and synthesizer timbres for some interesting effects. The Omni definitely can fill the "polyphonic need" of the budget minded synthesist." The fact that the Omni appeared in the Spec Sheet section of CK and the Equipment Review section of Synapse in the same November/December period, together with this two-pager ad appeared only a month later in January, seems more than a coincidence. It is all good evidence that ARP was doing some kind of coordinated promotional effort for the Omni at this time. Together with the fact that the ad-copy states that the Omni is "new", it all makes me really interested to know when the first Omnis came off the assembly line. And if it was truly 1975, ARP sure didn't seem too interested in promoting the instrument right away. You're completely right, the OMNI wasn't released to the market until late in 1976. According to the Oct 1976 issue of the Arpeggio Newsletter, the OMNI was introduced to ARP dealers and musical instrument manufacturers at the 1976 summer NAMM show. The front page of the same issue shows a picture of Les McCann playing an Omni: "Les McCann 1st to Try New OMNI". If I recall correctly the circuit boards in some OMNI's had a 1975 date on them so that may be one of the reasons some people thought it came out in 1975. Btw, isn't it a bit odd that the demo sheet recording for the Omni 2 is the very same recording as that used for the original Omni! I have the original demo and just noticed this. Both demo sheets share the same printing date: 11-4-76, which means that the Arp folks simply reused the original master with reprinted Omni 2 labels for the new demo, go figure!